If you’re after a ‘very metal’ bass, look no further. But consider adjusting the strap buttons. Excellent tone, build and playability. With the honourable exception of the late, inimitably great Bernard Edwards, the super-pointy brand of bass seen here is exclusively wielded by musicians of the heavy metal persuasion. It’s nothing to do with the body and neck woods or the electronics, although the pickups do issue an admittedly hot signal that is perfect for cutting through all those pesky guitars: it’s all about the splendidly extravagant body shape. On this third iteration of the American luthiers’ renowned Mockingbird instrument, aesthetics rule the day, although whether you sacrifice any playability for said interesting shape is a crucial point. Read on! For less than 600 quid, this is a beautiful, beautiful slab of wood. You can’t stop looking at the Mockingbird’s quilted maple finish, although the more risk-averse bassist may also feel some trepidation at the thought of your drummer falling on it. Those droopy horns won’t be for everyone, and we certainly won’t try to sell the shape to you: you either like it or you don’t. This China-made bass is a great indicator of how quickly Far Eastern production standards have risen over the decades. There’s not a flaw on it, which is quite something when you make some assumptions about the economics. You’re paying the distributor Rosetti £579. They’ll be paying BC Rich a portion of that. In turn that company will be paying the Chinese manufacturer... how much? Not much. And you still get a lustrous bit of wood. Go figure. to the leading edge of the body among them. BC Rich basses are famous, or rather infamous, for this problem - and as far as we know a solution has ever been offered by the manufacturer. Search YouTube and you’ll find brand-loyal bassists offering a novel solution involving relocating the strap buttons, which helps a lot but which won’t exactly add to the resale value of the instrument, so be careful. 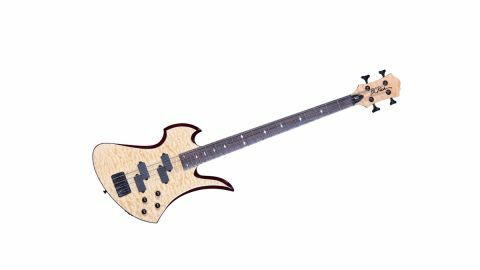 One reason why this hasn’t deterred bassists from buying BC Rich is that the instruments are usually played in metal bands, which usually means that they’re slung low, played with a heavy downstroked pick and with lines or riffs that focus primarily on the lowest frets and strings. Blend the pickup signals with care and you’ll find a very wide range of instantly usable tones, a remarkable asset at this price point. In this position, you can hold the neck up with your fretting hand and push the body down with your pick. This solves the problem, mostly. If you can’t get past the issue but are salivating for a BC Rich, the company’s custom shop will no doubt offer a solution, perhaps involving a 20-fret neck, a lighter-weight headstock and so on. Enough about that. Played seated, there’s no real problem: pluck away to your heart’s content. Tonally, this Mockingbird really sings. The two-band EQ is simple and useful, particularly if you’re after a scooped tone in the grand Megadeth, Anthrax and Guns N’ Roses tradition. The pots - all centrally detented apart from the volume, which earns massive points from us - supply more or less everything you need, including a surprisingly prominent, glassy slap tone. Like any slap player is going to buy a BC Rich, eh? With its relatively light body (another contributor to the diving headstock issue), the bottom end isn’t thunderous, so don’t be shy with that bass boost. Blend the pickup signals with care and you’ll find a very wide range of instantly usable tones, a remarkable asset at this price point. Metalhead or not, you’ll be playing this Mockingbird until the dawn chorus. This is an excellent instrument in terms of construction and performance, marred only by the balance issue. The Mockingbird’s gravity-seeking headstock may not worry you unduly, though, and indeed many thousands of BC Rich players shrug it off without a second thought. It’s all part of the heavy metal struggle, right? And at this price, with all the other features on hand, you’re still getting a great deal. But keep the receipt, just in case.